Pickled okra—spicy or not—is a fabulous way to keep the distinctive grassy flavor of okra around well past its summer and fall season. Luckily, it's super easy to make these delicious okra pickles. They are a crisp, flavorful element to serve alongside burgers or barbecue, and also wonderfully tasty as part of an appetizer or charcuterie platter. Note: This recipe gives you the amount to prepare per pint jar—feel free to double, triple, or quadruple this recipe based on how much okra you have on hand and how many pints of pickled okra you think you can eat. Trim off and discard any brown bits from the stem ends of the okra pods, rinse the pods clean, and dry them thoroughly with paper towels or a clean kitchen towel. Peel the garlic and cut it into thin slices. 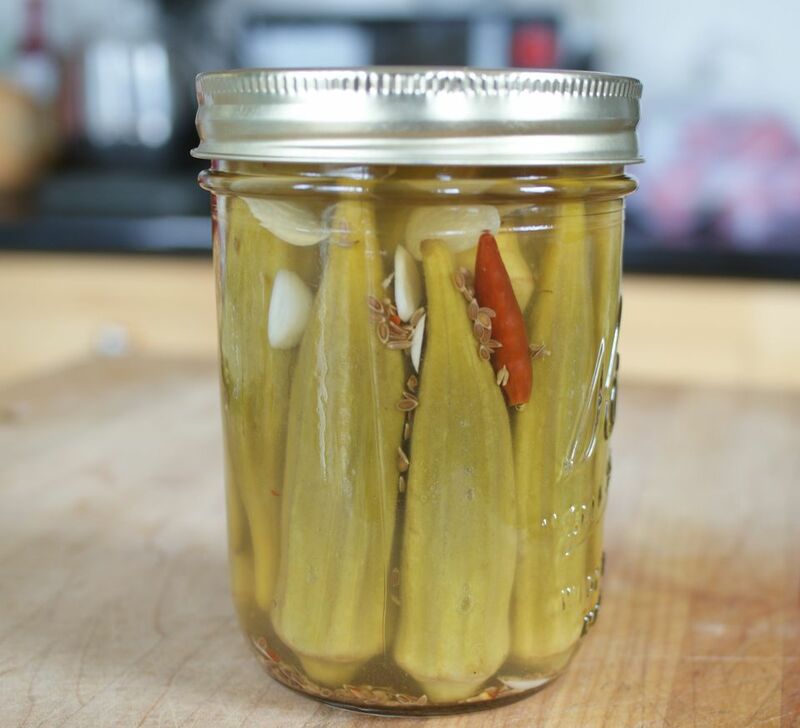 Stuff the trimmed okra, sliced garlic, and dill seeds into a clean pint jar. To make spicy pickles, be sure to stuff in the chile option. Be a bit aggressive, since the okra will shrink a bit as it pickles and you want to take advantage of the space in there. Bring the vinegar, water, and salt to a boil. Ladle the hot mixture over the okra in the jars, leaving about 1/2 inch of headspace. Close the jars. Let the jar(s) sit until they've cooled to room temperature. As they cool they may "pop"—all this means is the seal on the jar sealed itself. While a "popped" jar still cannot be stored in the cupboard (it wasn't hot-water processed), there is nothing wrong with that jar and it will keep in the fridge. Put the jar(s) in the fridge and let them sit for at least 1 week but ideally 4 weeks before opening to eat. Once opened, continue to store in the fridge.